Picking the Best BBQ Knife -Not all knives are the same – some are better than others. There are some well-known brands out there that have been found offering low-quality knives with a high price stamped on them. BBQ knives are something people use a lot, so selecting high-quality ones that have good handling, strength, durability and endurance is important. I understand that finding the best BBQ knife isn’t going to be easy and that is why I have put together my own personal list to save you from buying something that isn’t what it claims to be. When it comes time to purchase a knife set, it isn’t going to be as easy as some make it out to be. There is a lot that you will need to consider when you’re making this decision. In the past, I thought all knives were created equal, but when I moved into my first home (I was 20 years old), I couldn’t afford much and that is the moment I realized the value. Due to my low budget, I quickly chose the cheapest set I could find in the nearest discount store. It was a 12-piece set that has a chef’s knife, pairing knife, bread knife, utility knife, boning knife, a pair of scissors and some flimsy feeling steak knives. A day after, I was disappointed in the set – that’s when I realized there was much more to a knife than what meets the eye. With the steak knives, I couldn’t even cut through a piece of chicken! Yes, they were made from stainless steel, but each one of them still rusted. On a couple of handles, the blades even came apart. The paring knife was way too flimsy and the bread knife was too stiff. I don’t want you to make the same mistakes I made, and that is why I have decided to come up with this list of the best bbq knives for you. In my opinion, the top knife set would be the Wusthof BBQ knife set. 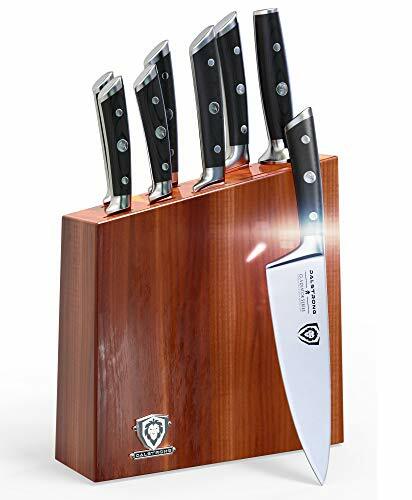 This particular knife set comes with a knife roll that holds 6 knives. Amongst the knives, you have the boning knife (6 inches), chef’s knife (8 inches), and the utility knife (4 inches). When it comes to prepping BBQ meats, regardless of the meats you’re prepping, this set has a knife you could use. Handles – The handles on the knives are black, so they will easily fit in with whatever color your kitchen is, because you know, black goes with everything. Also, I would like to point out that the handles are triple-riveted, so you will be able to get a nice comfortable grip on the knife while you’re cutting. Top of the Line Blades – In addition to the nice handles, the blades are made of high carbon steel, so you can count on them lasting for many years to come. Brisket Knife – The brisket knife is something that I feel the need to point out because it just so happens to be one of my personal favorites in this set. It is great for slicing and trimming meats that are larger in size. You can cut everything from prime rib and brisket to turkey, ham and roast with this particular knife. Boning Knife – The boning knife has a pointed, flexible blade that easily maneuvers right around the bones of your meats. If you cut a lot of poultry, then this is the knife you’re going to want to use. The best rated BBQ knife set may be a bit on the pricey side, but take it from me, it’s worth it. After some research, I discovered that the top rated knife set would be the Victorinox Swiss Army set. 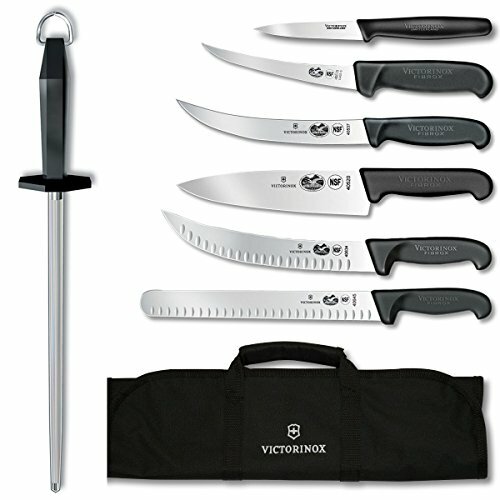 The Victorinox set is the type of set you find professionals and amateurs using in their kitchen. Included with this set, you have a chef’s knife, breaking knife, boning knife, paring knife, beef slicer, cimeter, a sharpening steel and of course the knife roll itself. Blades – The blades are made of high-carbon stainless steel. So when they go dull after a long period of use, you can easily sharpen them. Professionals Choice – As I previously said, this is the type of set professionals have used since the brand first came out – 1884. The Handles – The handles have a non-slip coating on them and are ergonomic, so they’re easy to hold on to, even when they’re wet. All of the knife sets on this list look great, but the best looking one, in my opinion, would be the FlyingColors Laguiole Steak Knife Set. This set includes a steak knife and six additional pieces. 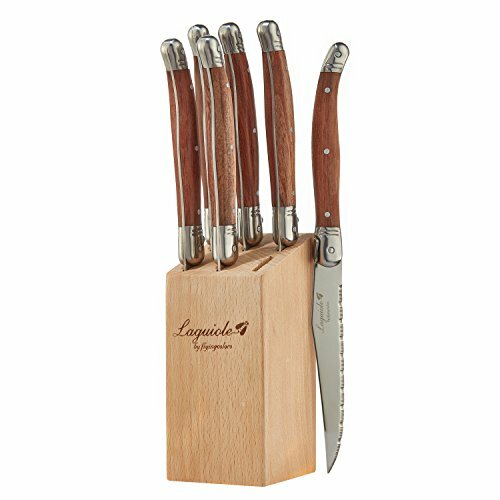 The Look – This is a stainless steel knife set and the wood-looking handles is what makes this set really stand out from the crowd. Small Block – If you have a small kitchen, or you just don’t like those big blocks, then this set is for you, because the block is smaller and will fit nicely in every kitchen. The block, despite how small it is, is really stable and does a great job at holding the knives. All in all, this, in my opinion just so happens to be the best looking knife set I came across. If you want a set that is affordable, but you don’t want to buy something that is lacking in quality, then this Victorinox knife set might just be a suitable option for you. 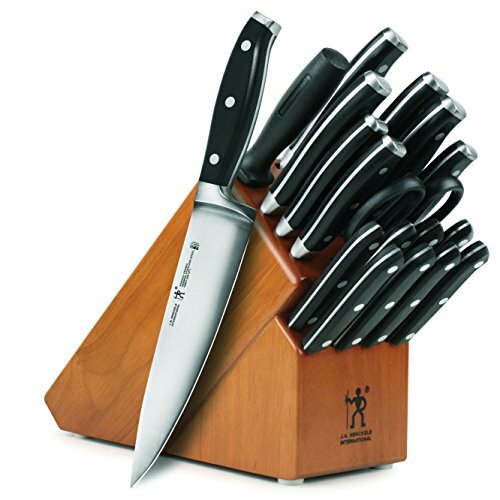 This set comes with a total of 6 knives, as well as the wood knife block. Blades – The blades have been tempered, hardened, etched, polished and finished in order to make sure they last a long time. They are stainless steel blades. The Handle – The handles are hygienic and yes, they’re dishwasher safe. However, while I find many that put their knives in the dishwasher, it’s not something I would recommend, because it causes them to have to be sharpened more often. If you’re looking for a set that is affordable, but you don’t want it to lack in terms of quality, then you should consider this set right here. The J.A Henckles International Forged 19 piece set may have a high price tag stamped on it, but after reading all of the reviews online, I honestly believe the price is well worth it. If you’re looking for a good set that will last for a very long time, then this one might just be suitable for you. Included – In this set, you will have a hollow edge pairing knife, serrated utility knife, paring knife, utility knife, boning knife, bread knife, hollow edge santoku knife, serrated steak knives, kitchen shears, a sharpening tool, and don’t forget about the block. Block – The block has a total of 18-slots, so it will hold all of the knives that come with it and there aren’t going to be any slots left empty, but that’s perfectly fine. I really like the cherry finish on the block and believe it would look great in most kitchens. J.A. Henckels is a company that really stands out from the crowd. There are many talking about having sets from 30 years ago from J.A. Henckels, so if you’re looking for a set that will last for a long time, then this one right here would be a great option for you. The best German set would be the Cangshan X Series and it consists of a total of 6 pieces. 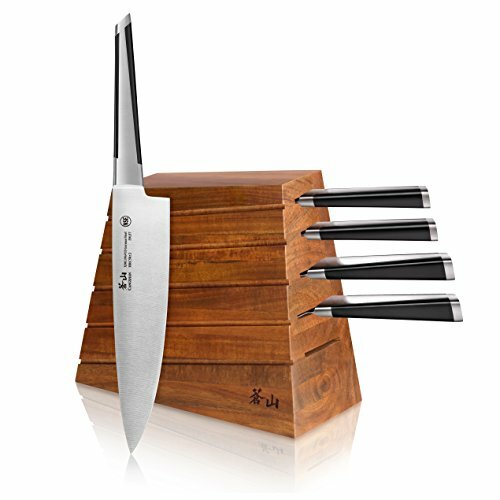 The unique design to the knives really makes this set stand out from the crowd with the sleek looking handles. 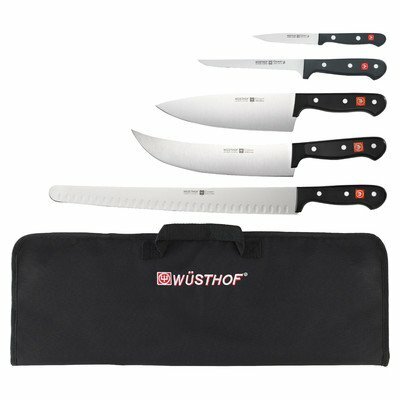 6-Pieces – This set includes 7 inch Santoku, 8 inch chef’s, 3.4 inch pairing, 5 inch bread and a block. Handles – When a chef works with tools in the kitchen, they want a connection with those tools, right? There are some that prefer heavy, large handles, while others prefer ones that are light. In this case, you have handles that are ergonomically designed and are super comfortable to use. Materials – These knives are made from high-alloy German steel. For those of you that aren’t aware, German steel offers a mix of durability and hardness. This type of steel takes makes for a sharper knife that will last for a longer period of time. If you’re currently on the lookout for a set that will bring you lots of compliments when you have guests over at your home, then the Cangshan X Series set would be a great choice. There’s only 6 pieces in this set, which is low compared to some of the other sets on this list, but those 6 pieces will go a long way. As I was browsing through the list of knives and reading all of the reviews, the one that quickly caught my eye was this set from Dalstrong – the Gladiator series. Design – The design of this set really caught my attention. It is obvious that they put a lot of thought into the design and didn’t set out to make a simple old bbq knife. 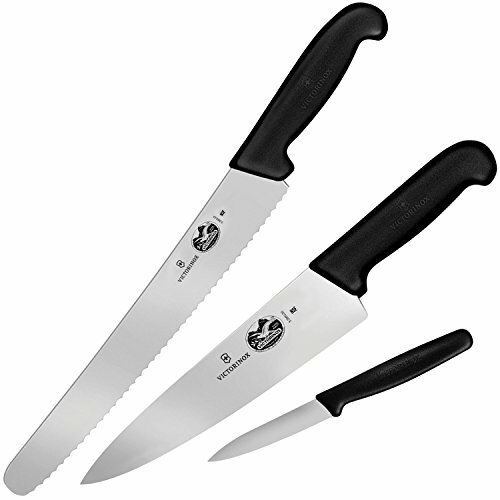 Razor Sharp – When you’re working with meats in the kitchen, you want something that is very sharp, and needless to say, this set isn’t lacking in that department. This set is made of high-carbon German steel and has a hand polished finish. Handles – The handles have that nice quality feel to them. The handles have that luxurious black color to them and are triple-riveted so that you can get a good grip on them. They have been polished and laminated for sanitary purposes. This Dalstrong gladiator series set is great for all kitchens, even those that are super busy. When it comes to knives, not everyone is able to afford that high price tag and that is understandable. In life, when you’re working with bills, kids, and all of that fun stuff, some just don’t have the money to spare on something like this. However, that doesn’t mean you have to settle for something that is low in quality. 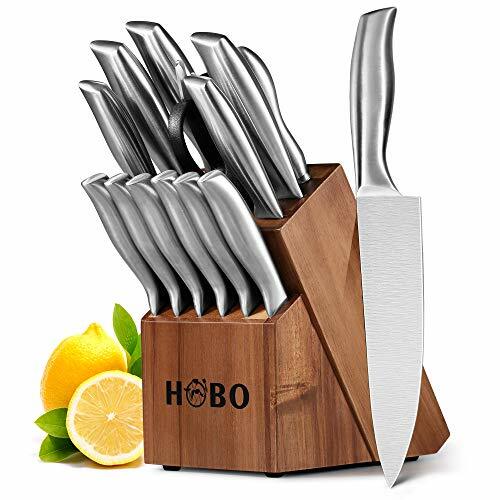 Today, I would like to introduce you to the HOBO Knife Set. This set consists of a total of 14-pieces, so you’re going to have something to work with. High Quality – This set is made of high quality stainless steel. They are easy to sharpen and won’t lose that shiny appearance. Includes – This set includes the basic accessories and components. You will have a chef knife, slicing knife, six steak knives, a bread cutter, a paring knife, a utility knife, a pair of scissors, a knife sharpener and of course, a block to hold it all. This set comes with all of the knives you’re going to need in the kitchen and in the end, you can store it away in its knife wooden holder. This set is perfect for professionals and amateurs alike. In the end, if you pick a knife set off of this list, regardless of the one you choose, you can rest with the satisfaction of knowing you’re not making the same mistake I told you about in the beginning. Each one of these sets has been thoroughly researched and proven to be everything they claim to be.